We’ve partnered with Tugg.com, which is a web-platform that helps individuals, groups and organizations to set up personalized movie screenings in theaters across the country. 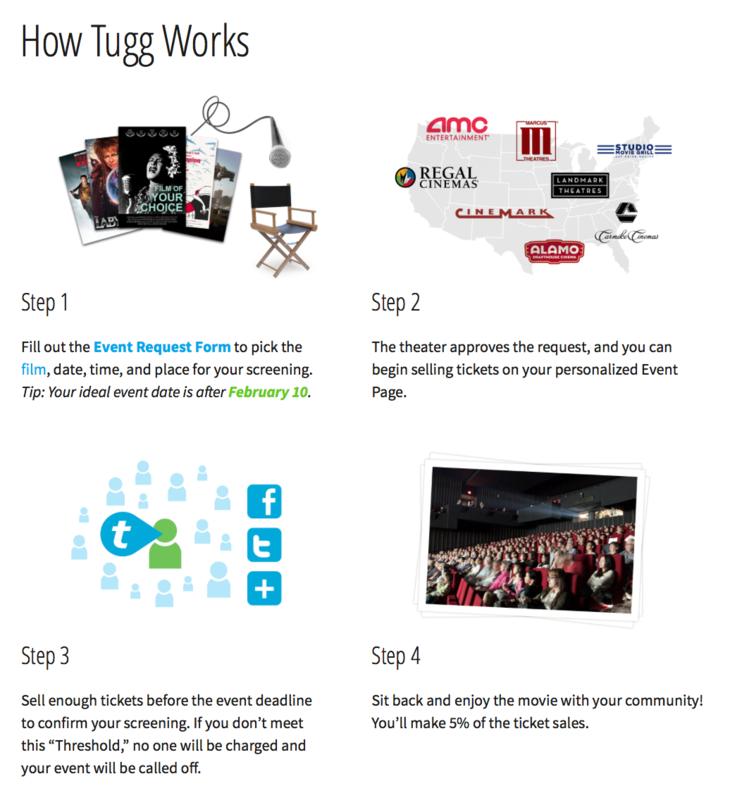 The process is simple – you pick the time, place and date, and Tugg will reserve the theater and give you a personalized event page for your screening (no cost to you). All you need to do is rally your community to pre-sell a certain amount of tickets (usually $500, so just 50 tickets at $10 per) There are also options for flat fee screening licenses for educators and organizations screening in alternative venues. Ready to plan your screening? Click here to request the film. With Tugg.com, you can also purchase community screening licenses individually, or through your organization, or university. The process is simple – click here to be taken to a purchasing page where you can select the appropriate license based on your screening needs. If you are partnering with a K-12 school or university, be sure to select the educational option. For additional information, or questions, please contact communityscreenings@tugginc.com.